Manabu Namiki has been around since 1993, but with most of his original scores being composed for the Arcade, he went unrecognised for quite a few years. Nonetheless, in 2003 he joined Basiscape to collaborate amongst some of the finest composers in the game music world, namely Hitoshi Sakimoto and Masaharu Iwata. His success came under this name rather than a change in console, as Namiki still remains very much as an Arcade music veteran and shooter king. Every original track on this album is composed by him, and its synthy style suits and brings alive the game in the listener’s mind. Namiki says it himself that he thinks it is his best work that he has done, but just how good is that? The disc is mostly ordered suitably into a series of stage themes with the odd boss or other theme to add variation. The stage themes stand out the most. “Fly to the Leaden Sky (Stage 1)” starts out like what some may expect to hear in a shooter genre soundtrack; energetic cyclical piano notes conveying the airborne ambience in assistance to synth that performs a light but mad melody line. Upon first listening, some, especially those that are used to traditional RPG music, may find this track totally worthless, but it has marvelous development and, like most shooter compositions, gets gradually catchier as it develops. “Underwater Rampart (Stage 2)” takes a different approach, but still manages to have similarities in the arrangement. Again, bouncy, airy synths appear in the opening, creating the perfect eerie effect for the rest of the track, which predominantly features Drum ‘n’ Bass styles and somewhat unsettling cross-rhythms in the bass line. “Tunnel Vision (Stage 3)” is another mood-setter, but is a lot more focused than any other stage theme on the disc; unwelcoming sounds jeer at you as you venture down the imaginative abyss-like stage, but it develops into something more captivating, though remains effectively assimilated into the rest of soundtrack. Expect to hear exciting electronica beats and moody vibes in this one. Coming into the center of the disc, “Degeneracy (Stage 4)” is the most fun of all stage themes. Sure to get your surrounding peers on the dance floor, Namiki has done well to accomplish a hard task by creating this entertaining techno gem. The subsequent track, “Subvorsive Awareness (Stage 5),” receives slightly more attention from the composer and offers a similar effect. Structured rather similarly — essentially just featuring a melodic initial section and a little break before repeating — it doesn’t offer too much new, though adds sophistication to the slight loss of the fun factor. The next theme, “Megalomaniac (Stage 6)” is, regrettably, the least interesting stage theme on the disc, lacking variation; simply comprising of beats against an unrefined melody, it could have been somewhat greater if more exciting phrases were added and a more original approach was taken. Finally, we approach “Marginal Consciousness (Stage 7)” which I presume is the final stage theme for the last level in the game. What I really find amazing about the theme is the fact that it sounds like all the other tracks on the alum, but it has its own unique climactic feel which goes well with the title of final stage. Good timing is an asset; if it were to go on for longer, it would have surely bored me. Boss themes on the soundtrack didn’t exactly measure up to the awesomeness of stage themes, none particularly being too impressive. The best and most interesting boss battle track is the first one, “Stab and Stomp! (Boss Air),” which indeed sounds like a battle theme to a degree. This theme is even more raging than the final battle which, in tradition, is supposed to be the most violent composition on the entire soundtrack. The second boss battle theme, “Thrust and Thrash! (Boss Surface),” feels a bit empty and indecisive in its direction. One moment it sounds playful, the next it feels like apocalyptic cacophony. I cannot enjoy a theme when it changes like this so often. The final battle, “Erupter (Last Boss),” is the perfect example of a track that is both good and horrible; good in that it would match its context without too much trouble, and horrible because, quite honestly, the composition sounds completely empty and rushed. I wouldn’t say that it was a complete waste of time, having some fortifying sections, but it doesn’t expand or success from the original basis a great deal. Namiki’s boss themes for more recent soundtracks, such as Mushihimesama, are much more remarkable and perhaps the soundtrack isn’t quite his best for this reason. And if you thought that the misery is over, think again; the remaining theme don’t give much or compensate anything for the disappointments that were the boss battle themes. The opening themes are brief yet interesting: “RAIZING logo ~ Rebellion” starts weirdly with voices shouting out ‘Raizing’ before moving into a stream of electronica beats for 10 seconds; “credit~start” merely features a few ambient noises and a three note fanfare; and “4:71am” is effective with its deep resounding bass line, but ultimately repetitive. The ending themes are also nothing to write home about. “Blood Brothers in the Dawn (Ending)” can be your typical everyday old-school ending theme; short, melodic, and ordinary. All that is featured is a sad but forgetful and underdeveloped tune with a little bit of percussion to emphasize the end. Straight after is another filler track, “Fatality (Game Over),” which, like “credit~start,” is obstructive to the flow of the soundtrack. The soundtrack concludes with “Bluescape (Ranking).” Tespite the apparent issue of length, the melody is catchy and it has fair structure. 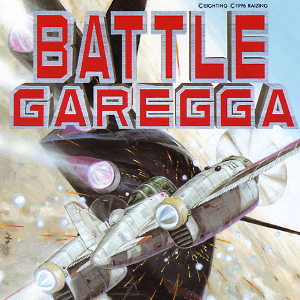 Like a few too many shmup soundtracks, Battle Garegga offers no impact outside its stage and boss themes. Manabu Namiki certainly cooked up a storm in Battle Garegga. The entire score is heavily synth based, but so what? Does Namiki create memorable music? Yes. Does the album stand the test of time? Yes. This ensures that the soundtrack will always live on in the hearts of Arcade gamers and shmup music fans alike. However, it doesn’t come off without major flaws understandable flaws. Pretty much everything on the disc which isn’t a stage theme hinders the consistency of the album, even though they add memorabilia to the soundtrack’s value; the boss themes aren’t strong enough, the opening themes are too brief, and the ending tracks aren’t at all sufficient. But overcoming this problem should be a breeze because the other tracks present are so wonderful. Though this particular disc is no longer available, the newly released Battle Garegga Perfect Soundtrack more than compensates; including all this original music and a brand new arranged section crafted by a variety of musicians, it is a must-have for those with a leaning towards intense electronica.